You are here: Thailand - Land Of Smiles » Commentary » What is it About Thailand? This past week I’ve been busy getting ready for my forthcoming trip to Thailand and that has occupied a lot of my time and taken away time from the blog duties. 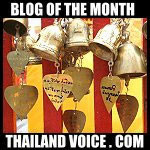 I’m always keeping up with the day to day of the blog though and yesterday while going through e-mails I got an interesting question from a reader that basically asked the simple question ” What is it about Thailand?“. Seemed like a simple question until I actually thought about it some more…turns out it’s not as simple as it first seemed. For me I think it comes down to more of a feeling than any one specific thing I can put my finger on. Sure, theres the unique culture and the exploration of a new place and it’s history. Immersing yourself in the fabric that is Thailand and trying to pull apart the individual strands of that fabric to learn more about this amazing place. Maybe it’s a case of the grass is always greener on the other side because Thailand is so different than America and so out of the norm of my day to day activities in the West. Obviously while I’m home in America life is less about exploration and more about the daily grind of work, bills and the bureaucracy of it all. There’s more to it than that though. It’s the feeling that this is where I should be and feeling that I’m the person I’m supposed to be when I’m there. I feel more alive when I’m in Thailand and much more like I can accomplish something much more worthy than just going through the motions of day to day life in the West. These kind of feelings are very hard to ignore even if it is a case of the grass is always greener. I’ve heard everything from ” it’s just a phase” to ” it’s just not realistic to keep going to Thailand or even think about moving there”. Family and friends always know just what to say. Those kind of comments have just served to draw me further into Thailand and away from the vicious circle of day to day living in the west. For now it’s just a feeling and yet another trip to Thailand but soon enough it will be leaving the shackles of what I’m supposed to be behind and starting a new adventure in Thailand. Life is not a spectator sport. This week will probably be a little spotty on the posting front while I’m finalizing all the little details of the trip and getting packed. But starting Friday I’ll have pre-scheduled posts going up while I’m traveling to Thailand and spending my first few days in Bangkok. I’ve told you how I feel about Thailand and I’ve shown you through this blog how I see this amazing country. From Friday on, until I get settled and start posting about my adventures, I’ll be showing you how great the Thailand blogging community is and introducing you to the bloggers and blogs that make this community more than just another niche.